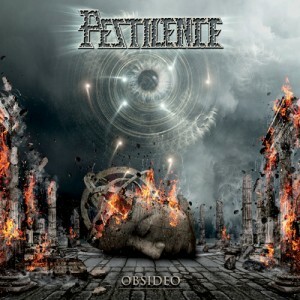 Obsideo is the new upcoming record of Pestilence. Yes the Dutch death metal veterans are back with a great monster of an album! Enough reason to contact Patrick for a quick mailer and drop some questions about the new beast! Hi Patrick, Obsideo is about to release? Exciting times right? Very much so!!! After a bit of a disappointment with Doctrine, which is still great an different from all previous, Obsideo really feels good!!! How was it to get this album done? We’ve had the most relaxed times recording ever. After Haley laid down his drumtracks, we knew that this was going to be a monster!!!! Who produced and mastered this beast? Like any other Pestilence album in the past, and now this one I did the production, but the mastering was done by Eroc in Germany. They did a great job. The album made quite an impact on the critics, how do you think the fans will dig this one? Well, I would hope that they will finally see that we always will do our best to deliver the goods. Also I hope that they will stop about this whole Consuming Impulse/Martin van Drunen comparison. It’s been 25 years. We try to become better musician all the time. I think we deserve some credit for always looking ahead and trying to be innovative. Which song stands out for you on Obsideo? Obsideo, the opener, is a monstertrack, but really, I can’t choose, they are all such great tunes…..But I know that people will get into Necromorph and Aura Negative a lot! Been a while since the previous record, what kept you guys busy between the albums? Not much, just going to our regular jobs. So there’s no pressure of needing to pay the bills by doing shows or touring. It takes about one to one and a half years to create 10 new songs, so that kept me busy. Also I have two sons that need their dad. So that keeps me pretty busy, with soccerpractise and matches. How do you keep the passion to get Pestilence up and running? You said it: the passion. I think we can still contribute to the death metal community. Pestilence has always been my passion since I formed the band. It feels like a child that’s grown up now. If I would run out of ideas, that would be the end. Pestilence is one of the starters of the Dutch death metalscene , how is it to be part of such a history? It feels great to be a part of that history. I think we where the first one out there of the Dutch metal bands having a record deal and being signed worldwide! If you look back at your career with Pestilence, which moment stands out and why? Getting signed, and every time holding that first new CD. And Obsideo is really special to me and the lads. What is the next milestone you wish to achieve with Pestilence? There are some places we haven’t gone yet in the world so I would love to do that with Pestilence. But milestone is too big of a word. Besides being guitarplayer/vocalist in Pestilence, what else is going on in your life? Like I mentioned before. Being a dad, maintaining a regular job and enjoying life in general. Death metal is a small strong scene here in Holland, how do you look at our scene in compare with other countries? Small country small scene’s and big country bigger scene’s. Death metal is really a strong community and is everywhere the same, except some counties like in South America where the crowds are more violent. The Dutch are more relaxed and critical about band’s performance. The album is almost out , I guess there will be some tourdates. What else is down the pipeline for Pestilence? Hopefully the bigger festivals next year. We want to go to Australia, New Zealand and maybe some shows in Japan. Maybe visit our friend back in South America to do some brutal shows! You guys came back in 2008 after a break up in 1994, was it hard to make a come back in the scene? If one thinks that it’s easy they need to re-think. The scene is constantly evolving and it’s a risk to be gone for so long. But we need this time off after Road Runner. Can you tell us a bit about the gear you use with Pestilence? We go directly into the board with the pod HD500. It’s easy to travel with and gives good sounds. The rest of the guys, dunno, since we will be playing over rentals…. You are signed with Candlelight records, how is to work with this label? They are doing a great job with us so far!!!! This is about it. Is there something you wish to share with our readers? Watch out for this album, it’s a monster. Hope to see you guys at one of our shows!! !